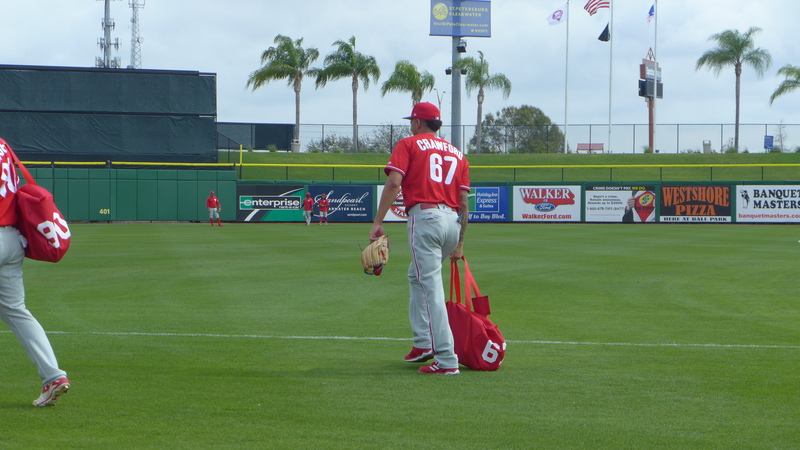 Day two of Pitchers and Catchers and even fewer fans were at the Complex. Perhaps people are waiting until the full team practice on Friday, or maybe fams have less of an emotional connection to the current group on the Major League roster. Oh well, more room for those of us who are here. After the players completed their stretching and calisthenics, I made my way over to Spectrum Field (yes, they are finally effecting the signage changes) to watch the position players take batting practice. We were permitted in the stands well down the left field line. If you are familiar with the stadium layout, we were in the section next to the VIP Diamond Dugout. We spent almost as much time trying to figure out who was batting as we did watching their at bats. Almost everyone is wearing a wind breaker around the batting cage. Big mystery who was batting most of the time. In the above picture, the second group of batters has gathered while group one is finishing up. With 6 players to a group and a handful of coaches, that’s 15 or more windbreakers. Sheesh! Some guys were easy to identify. That’s Herrera on the far left. Can’t miss the way he stands. Charlie stands out and I think Franco was easy to spot, but the rest all look alike to me. Finally figured out that the first group included Herrera, Franco, Saunders, Galvis, Kendrick, and Blanco. Group two included Gomez, Florian, Goeddel, Coghlan, Joseph, and Altherr. Saunders got a hold of a couple but no one else really stood out. Group three was easily identifiable (for me) and included Kingery, Hoskins, Crawford, Perkins, Cozens, and Featherston. Some better contact from this group. Perkins stood out. Why do we always seem to overlook him? With the off season acquisitions, I was recounting the potentially powerful Lehigh Valley line up to a friend and listed an outfield of Williams, Quinn, Cozens, Pullin and completely forgot Goeddel and Perkins. The fourth group contained the last 5 position players in camp to date – Pullin, Stassi, Quinn, Nava, and Williams. Pullin stood out. He put several balls on the berm, in the bullpen, and drove one off the upper portion of the batter’s eye in center field. He’s probably destined to start the season in Reading, but he looks like he’s going to make any decision short of Lehigh Valley difficult. Somebody asked about the physical size of some of the players. Foremost among the requests was Crawford. He looks fit but not any bigger than I remember. In the above photo Crawford doesn’t look as “thick”as Kingery who seems to have larger thighs and forearms. Below, he looks fine to me. I got back to the Complex in time to watch the catchers’ pop up drill. We had strong gusts today on the exposed fields at the Complex. Alfaro crashed into the fence in a futile attempt to catch a ball that caroomed of the fence well above his reach. I happened to be on the other side of the fence and cowered into a classic turtle position to avoid the collision that would never occur. Because, you know, there was a 40′ fence in the way. I think i heard Jorge say a bad word when he hit the fence. Tomorrow, I think I’m going to spend the day with the pitchers. PFPs can be boring, but BP when you can’t identify batters is too. A little updated numerology. 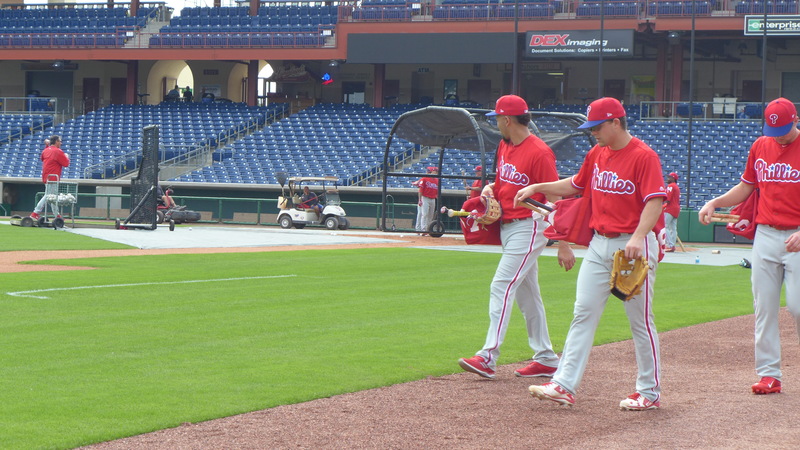 The Phillies issue numbers from 2 thru 99 to 90 players coaches and spring instructors and guest instructors. In the afternoon session, the minor leaguers who are early reports worked out. Cord Sandberg, Mitch Walding, Austin Bossart, Caleb Eldridge, and Luke Maglich took batting practice. Walding stood out. Sandy Ohio would be proud. Pitchers threw out of sight then came back to shag balls. Walding and Eldridge took ground balls at the corners after BP. Nick Fanti was a new face among the pitchers. Luis Encarnacion is also here but seems to be working his way back from a leg injury he suffered sliding into second during Instructs. I’m pretty sure that Zach Green is here, too. I saw him last week but couldn’t identify him at the time. Great report, Jim. One question – who’s Sandy Ohio? Sandusky Ohio was the username of a guy that would flood this website with pro-Walding comments a few years back — incidentally well before Walding’s semi-breakout year last season, so the comments always seemed a bit much…..
Hey, long time no hear, Gunner. I’ve missed your insights. Wow, ironic. I recently met a customer/friend from Sandusky, a musician singer songwriter named Dan May who now lives in the Philly area. Yeah, I was trying to avoid using the full name due to recent news. I figured long time readers would get the reference. My wife and I had dinner last night was a friend who is a former Miss America. She’s from — ta da, Sandusky, Ohio. 6 prospects on their list but no Sixto? Altogether encouraging. Williams (at #51) is still thought highly of by some. Surprised but glad to see JPC at #4. Interesting how the BA staff and the BP staff differ on rating shortstops. JPC, Torres, Rosario, Adames, Swanson and Rogers seem to be jumbled up with mixed reviews from each publication. If Sixto keeps doing what he did last year, he’ll probably be a top 30 consensus pick soon enough. Jordan (I believe) said he would have been a top 5 pick in the draft if he was eligible this year. He’s a serious, serious prospect and may have the highest ceiling of all of our prospects (off the top of my head, I can’t think of anyone with a higher ceiling except perhaps Moniak and perhaps not even him). As I’ve said before, Sanchez has the label “SPECIAL” when you talk to folks in the system. I agree with everything you said. Now let’s see him perform well at Lakewood. Six Phillies on the list is good, I think. They rank Williams higher than I would and Moniak lower. I am not among those thinking Perkins gets too little attention. I don’t know whether he’s been constantly fighting through injuries, but his past two seasons have not been good for a corner OF. I saw him play in Reading in 2014 and was excited by his performance, then I saw him play the larger part of that season in Allentown and he seemed lost at the plate. Another try at Reading in 2015 and he was not at all impressive — 200 OPS points off his 2014 performance. He was a little better in Allentown last season (certainly a lot better than first time through), but a .748 OPS for a corner OF isn’t good enough. He has the batting average, but doesn’t walk enough. The biggest problem is that he is neither a power guy nor a big SB guy. The defense is fine, but he was not an offensive force and he was age 25 last season. The Perkins we saw in the last year or two is the ultimate AAAA player. In order to move forward, some portion or portions of his game would have to get a whole lot better. Right now, he doesn’t project as a major league. Right now (and yes it’s real early yet) the bench going north looks like Altherr, Blanco, Knapp, Valentin and either Coughlan, Nava or possibly Stassi (all 3 are non-roster) who will be getting time in the OF this spring. Nobody else on the 40man seems likely. Quinn will likely be assigned to Lehigh where he’ll get playing time. Who is your OF in Lehigh and who is your OF in Reading? That might be correct, although AA is not a reasonable placement for Goeddel, but I guess it’s better than his not getting at bats at AAA. Williams/Quinn/Cozens with Perkins and Stassi platooning at DH. 8mark…I think they will want Valentin to get more PAs at the AAA level. Just under 125 is probably not enough. 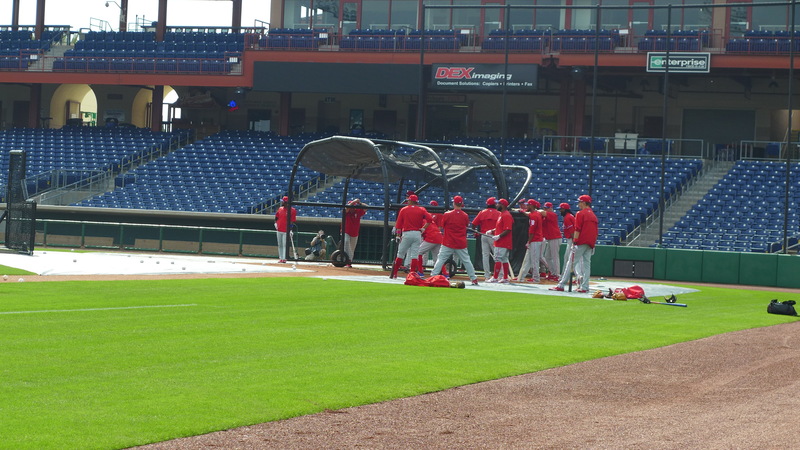 with the flexibility that Knapp (switch hitting C/1B and possibly LF), Blanco (switch hitting INF and back up C), Altherr (all OF position) and possibly Coghlan (as LH bat from the bench and will kick out Luis Garcia in the 40-man) – can the Phils start with 12 position and 13 pitchers? This should give Valentin and Goedel at bats in AAA/AA and squeeze Morgan and Asher in the bullpen (to join an 8-man pen of Neshak, Benoit, Neris, Ramos, Joely and Gomez). After Luis Garcia (which will be booted out by a LH bat), Morgan and Goedel are probably the others who will be on chopping block if the Phils decide to add either a Bench INF or LH pen. I agree with 8mark that Knapp, Blanco, Valentin, Altherr and Coghlan is the most realistic bench projection with Morgan joining Joely as the LH arm in the pen. KuKo…I think Valentin is AAA bound with either Pedro Florimon or Hector Gomez taking that spot, at least until May or June..
romus – assuming that the Phils will have an LH OF in the bench to boot out Garcia, who will be DFAd to add a bench INF? Morgan? Goedel? KuKo…I think you are thinking Stassi fills that LH OF spot? Then, if that is the case, bumping Luis Garcia off the 40. However, Florimon is a switchie…so that can fill a LHB slot, but he is not an OFer. But if it comes to it and Florimon is retained….Morgan, not Goeddel, probably gets DFAd. Remember, Valentin will only be there until JP comes up and they will swap spots. They’ll need to open up a 40 spot for JP. I guess there’s a chance they would keep someone like Gomez but it will require a 40 spot. Goeddel could get the last spot because he’s on the 40 already. Catch, not sure Goeddel is high in their eyes. May be a decent trade chip whose value they’ll try to keep. Otherwise I don’t see where he fits other than injury insurance. Between veterans in contract years, depth, good young arms, and motivated position prospects, we’re gonna surprise a lot of people. IMO. ….although they could opt to make Goeddel a 4th OF at Lehigh and keep the others fresh early on in the season. The IL utilizes the DH so that is another alternative for added PAs. 8mark…if you are wondering about the IL’s DH rulings — the DH rule is used unless both teams are NL, and then it is not used. In the IL, there’s 6 NL and 8 AL affiliates, so the DH is in effect in about 40% of the NL affiliates’ home games. Thanks Romus. Your thoughts on Goeddel as a prospect on 40man roster? However, come later this year in November when Tocci, Pujols , Pullin or whoever else needs to be added, with them all having reasonably productive years, and have a chance to be lost in the Rule 5, well that’s different. Normally a team will carry 7 or 8 OFers on their off-season 40…he could be squeezed. The Phillies are so overloaded with mid-level prospects that they are in a position where they almost have to begin trading some of them – or trading major league talent and promoting them. This is why I think there’s a legitimate chance that the Phillies are going to make an effort, at the trade deadline, to acquire a few valuable players on expensive contracts – the price, at least in part, will be some of these players who simply have no place to go due to the glut of young talent in AA, AAA and the majors. Something has to give. In my eyes the only value Goeddel has is the value you can rebuild in him this season at either LHV or REA. He’s got to play everyday and look like a star so they can trade him for something useful. DNAR….that looks to be the long term plan, and to his benefit also. I don’t think he’s that high either, he’s just not a AA player anymore and if they place him there it’s just due to a logjam, not his level of advancement. Agree. Tocci should be better as a similar type player although I’m not a big fan of his either. On another note, don’t know about you but it really bugs me that Mackanin says Jeanmar is still his closer. Is it merely posturing for a future trade? Just feel like it’s insulting with other more viable options in camp. Maybe it’s just me. Unless he gets injured, even with a mediocre ST, Jeanmar will be given the opportunity. Mack referenced Manuel and Lidge in ’09. Jeanmar , otoh, does not care where he is in the bullpen. Article in CSN Philly reports that Ted Williams called Pete Mackanin a “dumb hitter”. I’d like to add that he’s a dumb manager. Between staying too long with Gomez as his closer (and now saying he still is the closer) and benching Tyler Goeddel after his very good stretch in May, I think he has proved he’s not a very good manager. I hope the Phils don’t extend him for next season. I wouldn’t just give the closer job to the 39-year old Benoit. He had a very split 2016: really good for Toronto, really bad for Seattle, although he walked too many for both teams and in 2015 as well. Mackanin should certainly be very prepared for Benoit to win the closer job during ST. Yes, he should have kept playing Goeddel. That’s why I fear that the vets will take ABs from the kids, even if they aren’t playing well. Honestly, with where this team is now and how poorly Gomez performed late in the year and how borderline he is anyway as a closer, why did Mackanin say anything? Why do they need to announce their closer now for this rebuilding team and why does it need to be Gomez? Maybe he’s just trying to bolster his confidence – I guess that might make some sense. Otherwise, the whole statement is just kind of foolish, in my opinion. I know we are talking right now, but there is a lot that can and will happen before the break for Philly, it will be interesting who the 25th person on the roster will be. Stassi, Goddel, Florimon, Morgan, Garcia, etc, or none of the above. Whats the over under that they pick up someone else who is cast of another roster as spring training winds down? I think you are wrong saying that they aren’t high on Goeddel (when I say this I obviously don’t mean they are as high on him as lets say Crawford or even Cozens for that matter) . . . I say this because (and sorry that i’ve said this before) they kept him around all last year for a reason. If they didn’t like him they would have offered him back. Remember his spot could have easily been taken by a player like Perkins or even Williams. He’ll more than likely start in AA so he can play everyday. They wouldn’t keep him around to have him basically sit a 2nd year in a row, they will want him to play everyday. I agree that they want and need him to play ever day. I also agree that they liked him enough to keep him around, but that was not a very difficult task on a roster that fielded the worst hitting outfield in the majors and the worst hitting team in the majors. As for how high they are on him, I would say he’s in the mix and he’s going to have to prove himself. This team is not like the Cubs of a few years ago where there are several obvious future stars. Both in the hitting and pitching department, many of the young upper level players (and many in the majors) are true unknowns as major league players so the strategy is to let them play and, due to the sheer number of capable prospects, the odds are that some will rise to the top. The strategy makes sense, but I’m not sure I can recall a rebuilding team with this much upper level depth with so few “sure thing” prospects – it’s a new one by me, although it will be interesting to watch. I don’t ever recall seeing this many capable prospects on any particular AAA team – not just a Phillies AAA team – any AAA team. By May, you are going to see a stacked pitching rotation (Eflin, Appel, Thompson, Lively and Pivetta and possible Pinto!) and a real, major league prospect at virtually every single position (1st – Hoskins, 2nd – Valentin or Kingery, SS – Crawford, C – Alfaro or Knapp, LF – Cozens, CF – Quinn, RF – Williams). Folks, this just doesn’t happen very often. AA is typically the “prospects” league – it is rare for a AAA team, even a very good AAA team, to have more than about 4 or 5 really decent prospects. For the first half of the season, the IPigs could have something like a .700 winning percentage if all the players are healthy. They are definitely the “must see” team in the farm system to start the season. Goeddel was new regime’s 1st rule 5 pick so the cynic in me says he had the benefit of being their guy. So you might say the FO is high on him but the cleats in the dugout not so much. He was exposed pretty quick. Hands weren’t quick enough to handle hard inside. That’s an interesting observation. I viewed it as him not being strong enough to muscle tough pitches, both inside and out. He’s athletic and has a good swing – but, like Tocci, he’s really slight for a major leaguer hitter and I think it hurt him last year. I’d be curious what other hit gurus thought Catch. I think he is plenty strong. His first HR if you remember was over the 409 marker and he had another I really liked which was oppo against the Marlins. You know how it is with perception. I grant him this he didn’t get the amount of playing time he should have. And obviously there was disagreement between Pete and Matt on him. If they were on the same page then A. He plays more or B. They offer him back to the Rays and see if they can hold him and put him in AAA. Herrera got 147 games and 537 PA’s when they picked him up. Yeah, but the home run to 409, was when he could get his hands extended away from his body and build the bat speed. I don’t think he has the strength to muscle inside pitches for a hits. But, yeah, I’d be interested to hear what the hit gurus think. Also, you can’t compare him to Herrera – I get that they are both Rule 5 picks, but the Phillies hit the jackpot on Herrera who is a much stronger player with a superior hit tool and who stands a decent chance of becoming one of the best Rule 5 selections in major league history. That said, I’m not down on Goeddel – he’s in the mix and there’s a chance that he makes it down the line, although probably not with the Phillies.